Elaina Olden was a dominating student-athlete at Irvine High School (competed in 5 sports) and a star for the Orange County VB club under Charlie Brande. The nation’s top recruit was a college legend at The University of Pacific for Coach John Dunning. 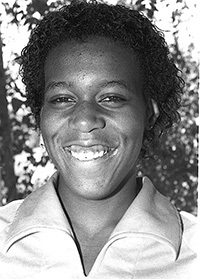 She led the Tigers to their only two NCAA titles in 1985 and 86 as a freshman and sophomore and was College Player of the Year in 1986 when the Tigers won the crown on their home court. In 1985 her UOP team beat her older sister Kim (a 2017 SCIVBHOF member) and Stanford in the finals. She was NCAA All-Tournament both years and named to the six-person NCAA 25-year All-Anniversary team and was part of NCAA All-Decade team from the 1980s. A major knee injury with the USA program caused her to miss the 1987 collegiate season and the 1988 Olympic team. She recovered to play for the USA in the 1992 Barcelona Olympic Games where she won the bronze medal, and the 1996 Atlanta Olympics. She played with Kim at the 1992 Olympics and with younger sister Bev in 1996 in Atlanta. Elaina played in 13 major international events over a 10 year period with the USA National Team including winning the 1995 FIVB World Grand Prix title. She was selected as a member of USA VB 75th Anniversary Team (1978-2002). She was inducted into the UOP HOF in 2000.